Tarandeep Kharbanda Talks About Magento, Its Community and Much More! We are back with another great personality of Magento community. This time we have Tarandeep Kharbanda with us. He is currently working as Magento Architect, Programmer Analyst and Team Lead at Rave Infosys Inc. He has more than 11 years of experience under his belt, in the field of Magento. He also has a Magento 2 Solution Specialist Certification. Muneeb: Tarandeep, please share some highlights of your career with our readers? Tarandeep: Thank you, Syed, for the honor. I have 11+ years experience in IT industry. For the past 10 years, I have been working with Rave Infosys. For the first couple of years, I worked on the core PHP project and an old DigiShop e-commerce system. After that, I was introduced to Magento and WordPress WooCommerce. Since then, I have worked with Magento and occasionally with WordPress WooCommerce, Shopify, VirtueMart etc. I have three certifications, including Zend PHP Certification, Magento 1 Developer Certification and Magento 2 Certification for Solution Specialist. Muneeb: Being a Magento 2 Certified Solution Specialist, what advice and tips you will like to give to the newbies who want to achieve this certification? Tarandeep: Getting certified always helps you know about strong areas and the areas where you need to work on. It also helps you know Magento more closely. My recommendation to all of those who want to achieve M2 CSS certification is to go through the Magento study guide and read the Magento dev docs. Both of these resources will help you in preparing for the exam. For the practice test, Swiftotter will be very helpful. Muneeb: And what is the impact of this certification in your career? Tarandeep: Before certification, I was assuming that I am an expert in Magento. However, post-certification I came to know that what I know about Magento is only a tip of the iceberg. I need to work on many other areas too. Without any doubt, it puts weight in your resume too and helps you grow further in the organization. Muneeb: What was your reason behind choosing Magento? And how do you compare Magento with other e-commerce platforms? Tarandeep: I still remember before my first implementation of Magento, we did a detailed analysis of Oscommerce, Prestashop, Digishop, Woocommerce, and Magento. Magento was the winner, and that’s where the journey with Magento started. Muneeb: What would you like to say about Magento Community? And would you like to give any suggestion to make it more better? Tarandeep: Magento community is awesome and full of awesome people. Ben Marks, Sherrie Rohde, David Manner, and many other folks are working day and night to make it more awesome and I really appreciate their efforts. To make the community better we need newbies to join the community and start contributing. 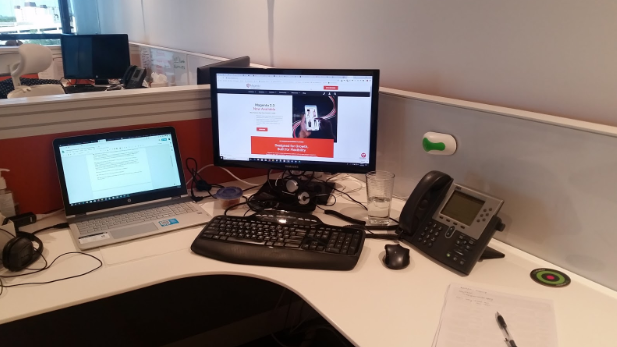 Muneeb: Please share the picture of your workplace with our readers? Muneeb: What would you like to say about the future of Magento? Tarandeep: Magento is my favorite e-commerce framework and no doubt it will stay the same with the release of 2.3, MSI, Page Builder, PWA, GraphQL and many more goodies. All these features have worked as game changers for Magento. Other e-commerce frameworks are way behind. Muneeb: Now let’s keep Magento aside! What are your hobbies? And how do you spend and enjoy your free time? Tarandeep: My favorite way to enjoy my free time is to spend it with my four year old daughter and wife. Whenever I get a chance, I love to watch a movie too. Muneeb: Everyone has some inspirational personalities in their lives. Name the people who have inspired you in your personal as well as professional life? Tarandeep: I cannot think of any other name then my Employer/Manager/Boss/Mentor all in one Ravi Mittal. I have learned uncountable things from him and have grown personally and professionally. PlayStation or Xbox? Not a big fan of both. But for the sake of question Xbox. Tarandeep: My good friend Kalpesh Mehta. You can connect with Tarandeep Kharbanda on Twitter and LinkedIn. **Editor’s Note: The interview is edited for clarity.